The land east of Zion National Park and the Kolob Terrace is generally lower and the mountains less sheer, but the cliffs and mesas are made of the same Navajo sandstone - white at higher elevations and red lower down - and these too contain interesting slot canyons, though not as deep as the more well known gorges to the west, and without streams running through. Two of the best are the upper and lower forks of Sand Wash (known collectively as Red Cave), which is a short drainage beneath the Elkheart Cliffs, at the east side of Long Valley and opposite the tiny town of Mount Carmel Junction. Both branches form slot canyons about half a mile long and less than a meter across in some places, with nice swirling red rocks quite similar to some of the canyons around Page, Lake Powell. The two forks may have chokestones and muddy pools, and the upper branch has several dryfalls of up to 10 feet making it harder to explore, but a lot can be seen without too much effort. The Elkheart Cliffs are the conspicuous red escarpment that borders US 89 to the north and east for 15 miles either side of Mount Carmel Junction, separated from the highway by several miles of sandy, bushy terrain. The two branches of Sand Wash/Red Cave start at the base of the cliffs, join a couple of miles south of Mount Carmel, then after a short distance the combined channel meets the east fork of the Virgin River. 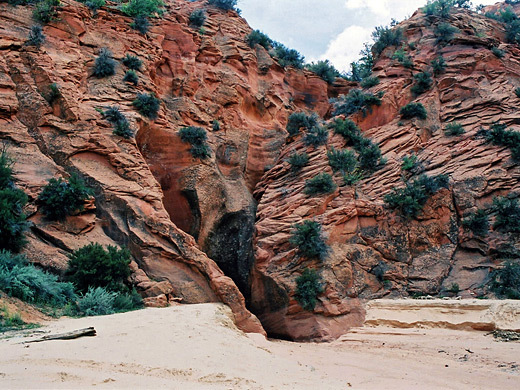 There are two ways to reach Red Cave, either by walking up Sand Wash for 3 miles starting from US 89, or by driving along rough tracks that lead close to the start of the slots. The walk from the highway is easiest though this does cross private property. For this, vehicles should be parked at the east side of US 89, 0.5 miles north of Mount Carmel Junction, where a small track leads down to the river, which at this point is usually 6 inches deep though can be fast flowing and several feet deep after recent rains. The suggested parking area is just opposite the end of Sand Wash, so the route is simply down the track, across the river then up the wash to the junction of the two forks, then along either branch to the start of the narrows. There is a private residence on the north side of the wash, close to US 89, and several no trespassing notices are posted along the wash, but walking up the streambed is thought to be acceptable. 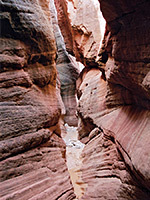 The slot canyons are on BLM land so there are no restrictions for hiking or camping, apart from two weeks each year when the area is used for deer hunting. The two branches of Red Cave can be visited as a loop hike in either direction though walking up the lower fork and down the upper fork is best, and this is the hike described below. 16 views of Sand Wash (Red Cave). TopoQuest topographic map of Sand Wash (Red Cave). 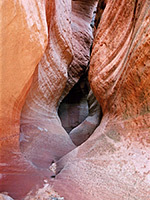 The right fork (Lower Sand Wash) becomes a slot canyon quite abruptly, where the wash emerges from a narrow opening in red cliffs, 2 miles from the junction with the upper fork. Right from the start the canyon is deep and enclosed, damp, gloomy and cold, since the dark red walls rise up and overhang above, blocking most of the sunlight. But after only a short distance, progress is blocked by a dryfall of 15 feet, which can only be passed by walking back to the start, up the slope on the south side, following a faint path above the canyon for about 5 minutes then back down into the narrows. Downstream, the canyon closes in quickly with boulders and small drops preceding a larger drop, and this section is just one of five good stretches of narrows, separated by more open parts of about equal length - total distance over half a mile. All the slot parts have a few chokestones above small pools, requiring climbs of 4 to 6 feet; nothing too difficult. 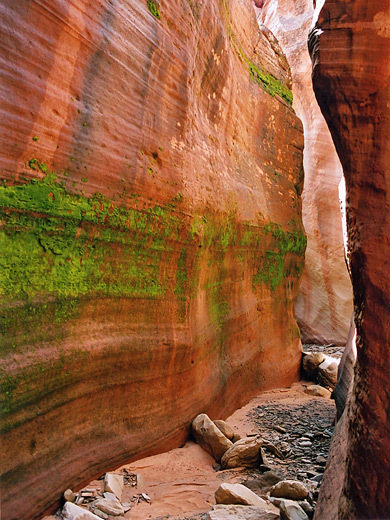 The rock walls are dark red, or lighter orange in places, quite smooth, curving, crossed by thin strata, and most of the passages catch the sunlight quite well, making for good photographs, and in the upper part of the canyon, several patches of dark green moss provide a nice color contrast. Floods bring large amounts of sand through this canyon, as well as boulders, so conditions and hence ease of exploration can vary. After the final slot, the canyon is now rather shallow, and higher cliffs rise up not far ahead. The shorter slot of the north fork of Sand Wash is due north on the other side of a low ridge, and to get there involves walking cross country for 2 miles, so a topographic map is needed. The route is up the side of the canyon until the land flattens out, then through woodland, down and up maybe a dozen small gullies and one larger drainage, eventually meeting a sandy jeep track; along here for about half a mile, to shortly before a small rocky plateau, then down the sand/slickrock slope on the right to the target canyon. 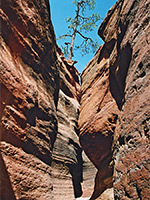 This has 2 upper forks, separated by a narrow but steep ridge, with both branches dropping over several dryfalls, joining to form a deep slot canyon that has further sheer drops into pools, some of which require ropes to descend. For those not suitably equipped, it is easy enough to walk at rim level and descend to the base of the cliffs that mark the end of the canyon, then re-enter at the lower end. Like the end of lower Red Cave, this part is dark and wet, liable to have cold pools several feet deep, beneath vertical walls that curve together high above, making the passages rather shadowy, and less good for photos. From the end of the slot it is about 2.5 miles down the wash to the junction with Lower Sand Wash, and then 1 mile back to the highway.